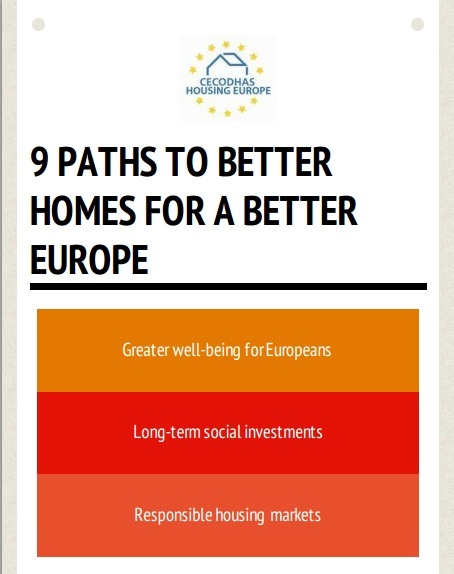 Better homes for a better Europe: The affordable housing sector and the elderly – "The Europe we want is for all ages"
CECODHAS Housing Europe, the European Federation of Public, Cooperative and Social Housing in light of the- what are expected to be- most important and challenging European Elections of the modern European history has identified “9 paths to better homes for a better Europe”. In its European manifesto, the organization that represents 41 member organizations from 19 countries in Europe charters the situation in the affordable housing sector across the EU and suggests concrete measures that need to be taken. “FIRST, we must work towards greater well-being for Europeans to restore confidence, social stability, avoid further societal inequalities and boost local job creation. SECOND, we must support the right long-term national and European social investment by ensuring better resources for social, public and co-operative housing. This will help us move towards a more resource-efficient and healthy Europe as well as lower socio-economic costs. Age related issues have always been an integral part of the housing agenda and an important element in CECODHAS Housing Europe advocacy objectives and work. Social, public and cooperative housing sector is able to guarantee alongside with access to decent housing, which is fundamental human right, a social mix that leads to social stability within modern urban districts. Furthermore, social housing providers are in position to bring and added value and offer a wide range of services to people who have more needs such as the elderly. CECODHAS Housing Europe has taken part in the HOST project that was recently concluded, offering some rather encouraging outcomes that are related to social housing providers and the use of technology. The Host project was launched in 2011 as a setup of experimentations and exchange of practices between 4 European countries- Italy, France, UK and Spain- and enabling the dialogue between different models of social housing organisations, such as the French generalist model of social housing and the Italian and English specialised model and the collaboration between different actors, such has housing providers, universities and institutional actors. The main project outcomes show that a participatory, bottom up approach to the application of new devices in a living environment, i.e. when the receivers of the service, in this case the elderly, are involved in the process of designing the devices according to their needs and expectations, there is a cost efficient approach that not only leads to the creation of more functional tools, but also contributes to the creation of new relationships among elderly living in the same community. Such an approach also strengthens the relationship between the elderly and the providers of health and social care services, thus responding to the problem of isolation and providing more effective response to real needs. CECODHAS Housing Europe strongly believes that the affordable housing sector is tailored to the needs most elderly people have across the EU. Therefore it is committed to continue its advocacy work to better tackle these needs and make the EU and its cities and built environment more age-friendly. We will do so by investing in alliances with other devoted organisations like the AGE Platform.